Photo: Olsen House, ca. 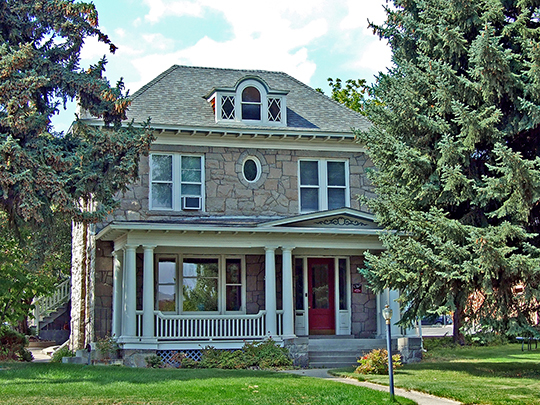 1874-1884, 516 North Park Avenue, Helena, MT. Listed on the National Register of Historic Places in 1991. Photographed by User:Robstutz (own work), 2012, [cc-by-3.0 (creativecommons.org/licenses/by/3.0)], via Wikimedia Commons, accessed March, 2014. Lewis and Clark County offices are located at 316 N Park Avenue, Helena, MT 59623; phone: 406-447-8304. Established in 1865 the county was originally named Edgerton for Montana's first territorial governor Sidney Edgerton [1818-1900]. A former U.S. Congressman, Edgerton had been serving as Chief Justice of the Idaho Territory Supreme Court at the time of his appointment by President Abraham Lincoln in 1864. The name was changed from Edgerton to Lewis and Clark in 1867.